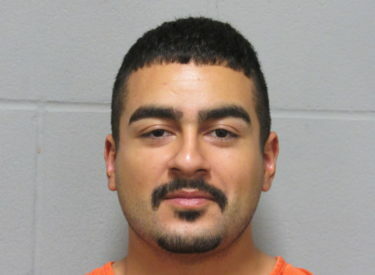 The Kay County Sheriff’s Office arrested Everardo Rodriguez, 23, at 3:50 a.m. Monday after a pursuit and standoff that started at 9:48 p.m. Sunday. Sheriff Steve Kelley said Monday morning Rodriguez is a suspect in a pharmacy robbery in Yale, Oklahoma, in Payne County. He also has a Kay County warrant for failure to pay and is wanted for questioning in connection with robberies in Kay County. Kelley said deputies spotted Rodriguez in the area of Wal-Mart Sunday night and tried to initiate a felony stop on him at 14th Street and Hartford Avenue. Rodriguez failed to stop and continued to Pioneer Apartments, 715 Monument Road, where he entered an apartment where he knew the residents. Kelley said law enforcement personnel from the Sheriff’s Office and Ponca City Police Department quarantined the area and the Ponca City Tactical Team spent numerous hours trying to make contact, with no success. The Tactical Team then made the decision to enter the apartment and launched a stun grenade, known as a flash bang, into the apartment. Rodriguez was subdued by gas and officers took him into custody without incident. Sheriff Kelley said Payne County has set a bond of $200,000 for Rodriguez in connection with the Yale pharmacy robbery. He has not yet been charged in Kay County but is in custody at the Kay County Detention Center.